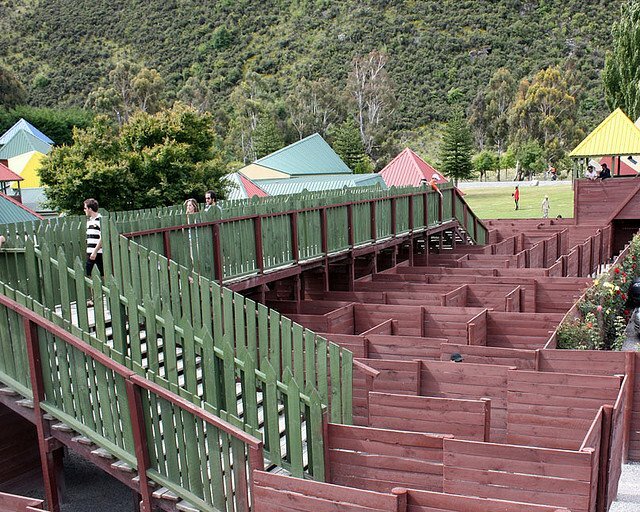 You are at:Home»Bizarre Tourist Attractions»Puzzling World: As If You Needed Another Reason to Visit New Zealand! If you’ve seen any of the “Lord of the Rings” movies, you’re familiar with the sweeping mountain landscapes and crystal-clear waters of New Zealand. 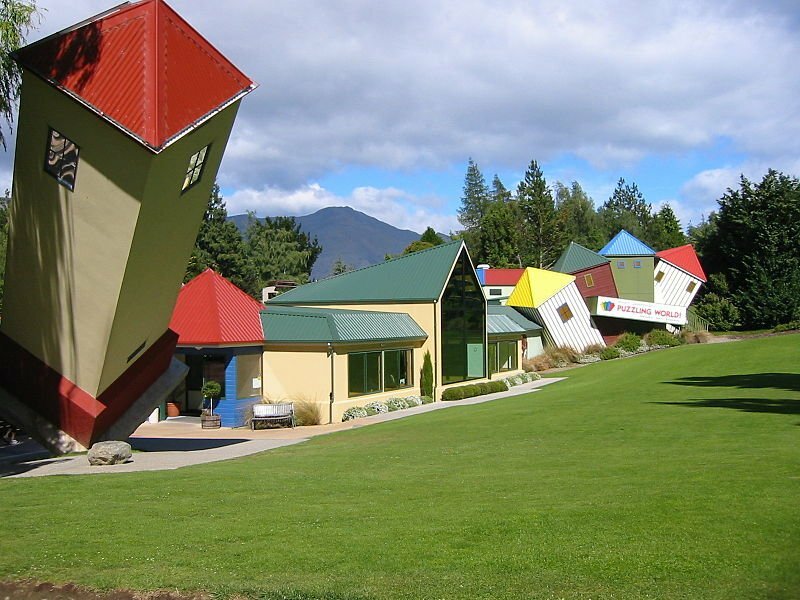 But unless you’ve already traveled to Lake Wanaka, located adjacent to spectacular Mount Aspiring National Park, you’re probably not aware that New Zealand is home to one of the wackiest, most mind-blowing collections of architecture and design in the world. The brainchild of well-known local skeptic Stuart Landsborough, Puzzling World started out in 1973 with a gigantic maze. Since then, it’s grown into a phenomenal assemblage of gravity-defying structures, mind-boggling optical illusions, and even a $100,000 Psychic Challenge. 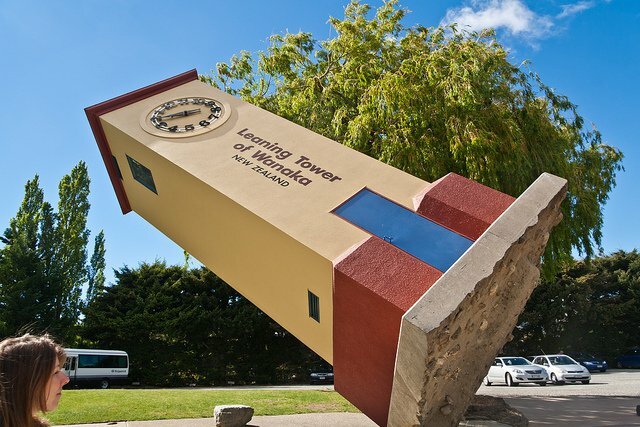 Visitors entering Puzzling World are immediately bombarded with its signature combination of kitsch and cool, passing by the amazing Leaning Tower of Wanaka — balanced on its edge at an incredible 53-degree angle and sporting a backwards clock — and the giant labyrinth with almost a mile of passages on two levels. The real fun, though, begins after you enter through the crazy-looking Tumbling Towers. 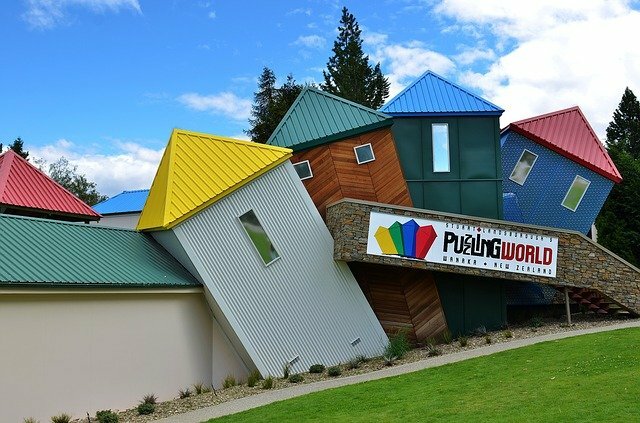 Puzzling World features five perception-altering illusion halls, each one designed to confound your senses and scramble your brain. It begins in the Hologram Hall, containing one of the world’s biggest collection of holograms. The next room is the Hall of Following Faces, where things start to get just a little bit creepy, as each of the 168 models of well-known faces seem to follow you as you move around and through the room. Next you’ll come to the Ames Forced Perspective Room. Prepare yourself to be completely astonished here — although this room has been built to extremely distorted dimensions, it looks absolutely normal when viewed through a window. 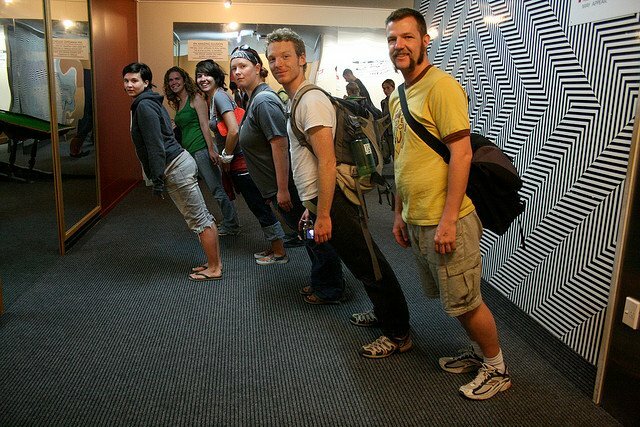 Then defy gravity (or so it seems) in the amazing Tilted Room. Built at a 15-degree tilt, this room tricks your brain into thinking that everything inside — including your own body — is hanging at an impossible angle. In the Sculpt Illusion Gallery you’ll find an impossible bench, a suspended waterfall, stone carpets, and a host of other wild and wonderful artwork. Even the cafe at Puzzling World is eccentric, as all the tables are decked out with mind-bending puzzles for you to try. 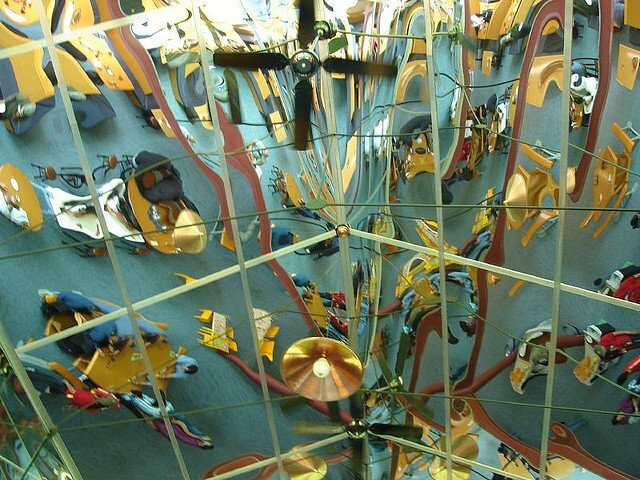 Remember to look up and enjoy the crazy kaleidoscope ceiling — it’s like no ceiling you’ve even seen before. And be warned: the Roman-style bathroom is just another illusion. This realistic-looking mural is designed for photos, not for personal hygiene! 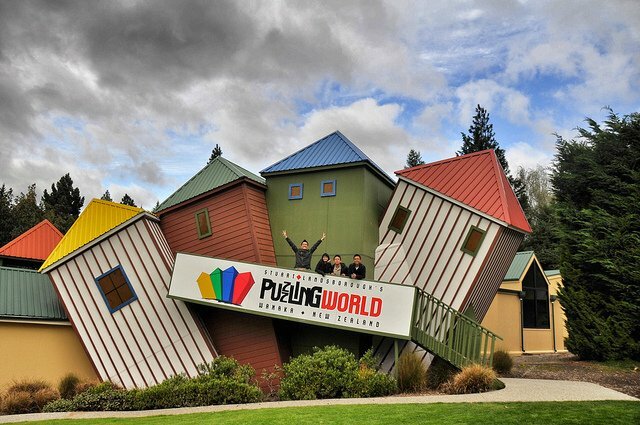 New Zealand is on my bucket list for this year, and I’ll have to make a stop at Puzzling World. I just adore quirky stuff like that, thanks for sharing! Looks like you had a blast!